But I’m not talking about Mike MacIntyre. I’m talking about the original Coach Mac, Bill McCartney. If you watched ESPN’s The Gospel According to Mac, then you know that Coach Mac is, without question, the greatest football coach to ever step foot onto the Boulder campus. And yet, through three seasons, he had accomplished nothing. It took Mac four years just to finish with a winning record, and it took another four after that to finish the season ranked inside the AP Top 25. That’s the type of time coaches aren’t afforded anymore. 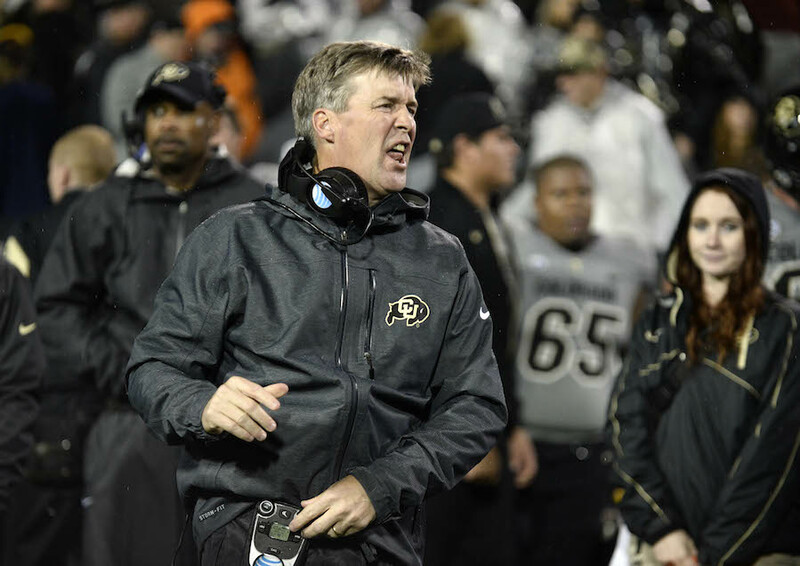 Today, the Buffs find themselves in a position where they’ve cycled through three head coaches in the last decade and may be considering moving onto a fourth. In a world where every decision, play, word and facial expression is dissected instantaneously across social media and the Internet, tinder burns faster. We see it in both college and professional sports. Whether we’re talking about players or coaches, there’s no leeway, no grace period. If you’re not performing to the highest of standards, they’ll be a firestorm of blog posts and message-board comments calling for your head within minutes. A few decades ago, people were allowed to actually improve, to learn from their mistakes and grow. Today, we expect a finished product from day one. Who knows how many talents have been lost to the short leash? We lack perspective, the ability to see the big picture and not become reactionary. We see that coach MacIntyre is headed towards his third straight losing season, that his team still can’t pull out a close victory, and we become reactionary; we call for a change. Well, let me tell you this: The grass is not always greener on the other side. Let’s just say MacIntyre’s Buffs do lose their final four games, finishing 4-9 on the season. Even then, MacIntyre’s 10-27 record (a .270 winning percentage) through three years would be better than McCartney’s (.212). And you could make the case that MacIntyre was coming into an even more dysfunctional situation. In the five years before McCartney came to Boulder, the Buffs were 20-34-1 (.364); for MacIntyre, the Buffs were 17-44 (.279) and had just entered the Pac-12 conference, a conference that from top to bottom has consistently only trailed the SEC in terms of overall strength. Building a program takes time. Unless your name is Jim Harbaugh, nobody’s becoming a powerhouse in one season, and even then, Michigan had still been getting top-10 recruiting classes under Brady Hoke. That’s not a luxury MacIntyre was gifted when he first came to Boulder. Instead, MacIntyre was handed a poorly-constructed, young roster and a training facility that was one of the worst in the conference. He’s been working from behind the eight-ball from the day he stepped foot on campus, and I’m not so sure what people expected him to accomplish in these last three seasons. It’s seemed bad, yes. The Buffs have been blown out (a loss by 20 or more points) nine times under MacIntyre, but they’ve also had eight losses that have come by less than one score. For comparison, during McCartney’s first three seasons, his teams were blown out 12 times and only lost five one-score games. Now, I’m not saying MacIntyre is going to go on to win a national championship and solidify the Buffs as one of the best college programs in the nation for a decade-plus, but I am saying that he’s got a better shot of doing that than anybody else the university could bring in. This isn’t MacIntyre’s team — the final version, at least. There’s not one senior on the field that was actually recruited by MacIntyre, and the new, state-of-the-art training facility that is now finishing up construction is only just starting to play a role in the Buffs preparation, as well as their recruiting. If the Buffs move on again, they’ll be starting over again. With MacIntyre, he’s building a culture, a program, a history, and that takes time.